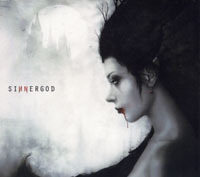 Share the post "Album review: SINNERGOD – Sinnergod"
Described as “Goth Metallers” this is the Wigan/Manchester quintet’s sophomore album release. There’s a confidence at play, the more so when you realise it has been conceived and produced locally and by the band’s twin brothers Mark (vocals/guitar) and Chris Hampson (drums). The sound taps into a current, and healthy, trend to meld electronica and rock with heavily layered sequences and an anthemic chorus or three. It’s easy to make comparisons with the likes of Depeche Mode but Sinnergod have a rockier, and arguably, even wider appeal. And as atmospheric in its own way as Katatonia. Ever since this crowd landed a spot at Bloodstock – in August 2007 – they have been on the upward trajectory and have also worked with one-time Iron Maiden singer Blaze Bayley. Their first album – ‘Seven Deadly Sinphonies’ – was released in 2014 and before that there was a string of EPs. This album is suitably dark in places, rousing in others, with plenty of heavy riffage. The opening track ‘Dead Of The Night’, with its broody intro, exudes confidence whilst a former single ‘Burn’ is immediately infectious with a pleasing and relentless monster riff. ‘The Endless’ starts with almost symphonic guitars and is another standout giving full rein to the band’s anthemic approach and this is repeated on ‘The Watched’ – like Tears For Fears heavied up, but in a good way. This has lovely synth motifs and some effective female vocals. What a fantastic track. ‘Joshua’s Day’ might also appeal to modern-day Marillion fans with a Rothery-style solo and a proggy vibe throughout. The quality quotient during this 60 minute-plus extravaganza never slackens and just when you thought it couldn’t get any better the band pull out ‘The Supernatural’ another example of the band’s broody, dark and extremely appealing vibe with a superb play-out at the end. ‘We’ve Been Expecting You’ even features a ‘Carmina Burana/O Fortuna’ style amassed choir which if nothing else demonstrates the band’s bravado and maybe suggests a collective sub-career composing for horror ‘B’ movies. This track also has another rather fine guitar-led play-out. ‘Johnny Sits Perfectly Still’ reminds me of a very heavy Chris Braide/Geoff Downes (DBA) piece and this shouldn’t surprise as DBA are locked into anthemic eighties-rooted pop rock. Again, simply wonderful. The band are influenced by the likes of Maiden, Megadeth and Metallica and ‘We Don’t Have Anything’ is perhaps the least convincing track on the album, taken in context. I can only think it might hark back to previous releases with a blend of thrash/power metal verse/anthemic chorus. To be honest it’s really refreshing hearing a young band who are prepared to break out of the now predictable Led Zeppelin template. I can’t mask my own love of certain eighties synth-fused music and, in the right hands and with judicious use of rock guitar, it can still be relevant. This entry was posted in ALBUM REVIEWS, ALBUM REVIEWS (Mobile), All Posts and tagged album, alt rock, electronica, goth, metal, pop, review, rock, Sinnergod. Bookmark the permalink.